Affiliated to OFFJAZZ DANCE ACADEMY, NICE, FRANCE as board of DIRECTORS & EXAMINERS. Rhythmosaic is not only an institute which imparts training, in Dance or Movement Arts. 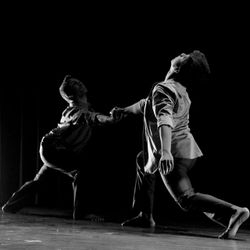 It is an institute which tries to inculcate, a method of 'Thinking Approach' when it comes to address expressional and experimental issues, specifically through Movement Art. At the same time, a rigorous training in INDIAN CLASSICAL DANCE, KATHAK. The school offers this one year intensive course work to facilitate the students with formal training in above mentioned art forms in its truest sense and technical abilities. After completing the course the students gets an opportunity to be Faculty at Rhythmosaic School and Dance Institute, Audition for Rhythmosaic - Sengupta Dance Company to be a part of the International touring team, can apply for scholarships in institutes abroad.